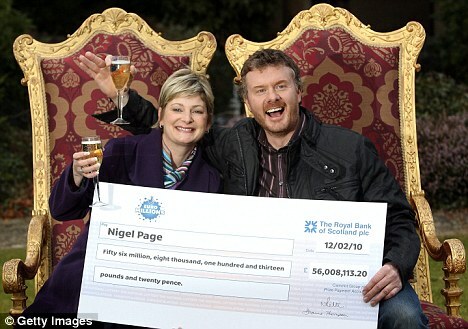 The Euromillions £105 million jackpot is bigger than Nigel Page's $56 million record set in 2010. Twice a day I settle down into my Aeron executive chair and tap away at the Mac keyboard. I'm updating jackpot figures for the biggest lotteries in the world. And quite honestly, some of those amounts just don't get me revved up at all. It has got to the point that anything under $10 million seems hardly worth it. That's what happens when you get used to dealing in large sums... all of a sudden they don't seem that big at all. So when the UK Euromillions jackpot hit £105 million (about US$82,000,000) yesterday, suddenly everyone I knew got interested. And the UK Daily Mail reported that lottery stores were selling a staggering 800 tickets every SECOND for the coming Friday night's draw. This special Euromillions Millionaire Raffle is going to make 100 millionaires out of players. If you want to be in the draw for these games, you'll have to buy in the next 6 hours, else I won't be able to supply the PRO Custom Profiles to you.